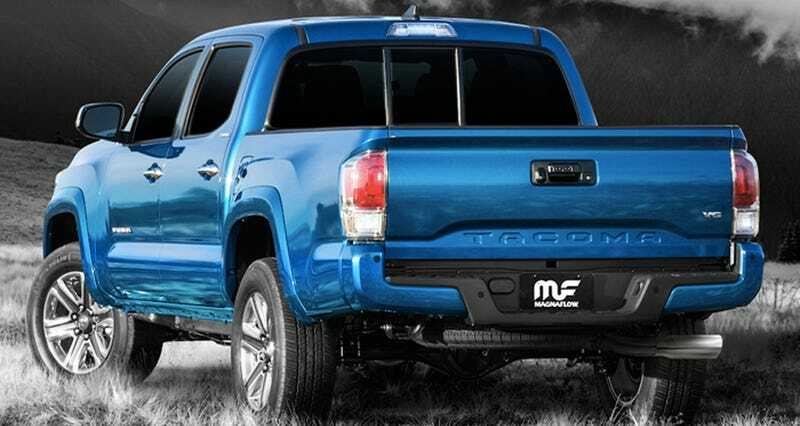 Some ambitious owners have already slapped new mufflers on the 2016 Toyota Tacoma, but MagnaFlow is claiming the first true dyno-tuned 50-state legal exhaust system for the new truck..
MagnaFlow’s system for the 2016 Tacoma’s 3.5 V6 runs all the way from the catalytic converter to the exit tailpipe (typically called a “cat-back exhaust”) and is made of three-inch mandrel bent stainless steel tubing, feeding into a single stainless 18-inch muffler and exiting with a four-inch polished stainless tip. Of course, those Flowmaster and Borla sounds you just heard were for mufflers only; not true “cat-back” systems like the MagnaFlow, which again is the first of its kind for the 2016 Tacoma. The difference is that cat-back systems have been known to add a little power, a muffler really only changes the sound. The new MagnaFlow system will set you back about $675 with a lifetime warranty. Exhaust pipes are pretty easy to install, especially since there can’t be too many brand-new Tacomas with rusty bolts down there yet. I’d budget about an hour’s labor at your local shop or a weekend afternoon if you’re going to attach it yourself.